Elliott Morss critiques the upcoming book on the global economy, The End Game by John Mauldin. The book will attempt to demonstrate how larger government leads to slower growth and will have an extended discussion of trade deficits, government debt, and private debt. See the following post from The Street. John Mauldin, a leading economic blogger, is writing a book to be published shortly by Wiley entitled The End Game. The book will discuss the global economy and alternative policies to move the world forward. He recently published a draft chapter on his Frontline Weekly Newsletter . I read it, and it got me thinking about missing pieces. First, Mauldin says a $1.5-trillion-dollar yearly increase in the national debt means that someone has to invest that much in Treasury bonds. Treasury bonds? How about bills and notes? OK, Mauldin was using "bonds" as shorthand for all Treasury debt. How about the debt incurred by federal agencies? OK. That might be quibbling. But here is something that is not a quibble: the Federal Reserve "deficits." Take a look at Table 1. Mauldin does talk of "monetizing the debt" -- converting Treasury debt into currency -- but the Fed did a lot more. In 2008, the Fed ran a "deficit" (change in liabilities) of $1.3 trillion. How? They did it by monetizing some Treasury debt, creating bank reserves and buying AIG and other bad assets. $1.3 trillion is a lot, just about the same as the Treasury deficits in 2009 and 2010. Of course, there are some assets to offset these liabilities. Consider this Fed deficit against the Troubled Assets Relief Program (TARP). TARP was capped at $475 billion in the financial reform bill. Just as with the Fed's deficit, there are some assets to offset its liabilities. But there is a big difference: TARP had to be approved by Congress and signed by the President. The Fed's activities only have to be approved by its board. Second, Mauldin says he will discuss monetizing the debt in a later chapter on inflation. I have not seen that chapter, but the automatic association of the Fed buying Treasury debt with inflation is common and not always correct. 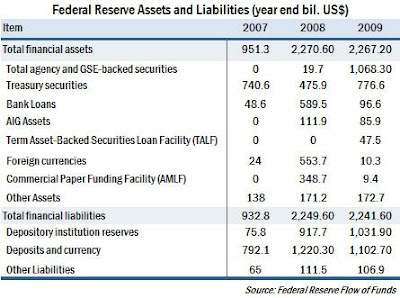 As Table 1 indicates, the Fed "monetized" $300.7 billion ($776.6 billion minus $475.9 billion) of Treasury debt in 2009. Inflation? Hardly. With a capacity utilization rate around 70% and a panicked world desperate for dollar-denominated assets, the dollar got stronger. In an earlier article, I pointed out there are two sources of inflation (a weaker dollar). The first source occurs when aggregate domestic demand is greater than what can be produced (most definitely not the case in the U.S. now). The second source occurs when the global supply of dollars exceeds the global demand (not currently the case). In short, the Fed buying Treasury debt (debt monetization) does not automatically cause inflation. Third, Mauldin asserts that bigger government leads to slower growth. He claims he will demonstrate this in his book empirically by showing that countries with lower government expenditures to GDP ratios grow more rapidly than countries with higher ratios. I suggest that if you want to focus on one ratio to explain growth, try the total investment to GDP ratio. China's investment/GDP ratio is 45%, higher than any major country in the world. And look at its growth rate. Fourth, Mauldin has an extended discussion of trade deficits, government debt, and private debt in his draft chapter. And we certainly hear a lot about the U.S. trade and current account deficits in the daily press. But how about net financial flows appearing in the U.S. Capital Account? Ever heard of it? It provides critical data if you want to understand what has and will happen to the dollar. Table 2 provides the data. The financial flows are large. Note that in 2006 the net financial inflows ($809 billion) more than offset the current account deficit ($803 billion). It hasn't been the case since then. The table has three primary sections: U.S. iInvestors abroad, foreign investors in the U.S., and fFinancial derivatives. When the U.S. government or the private sector invests abroad, global dollar holdings increase putting pressure on the dollar. The opposite holds when foreign governments or the private sector invests in the US. The 2008 panic can be seen in the numbers. Americans sold foreign securities and foreigners sold their US equities in favor of Treasuries. Note the foreign governments' purchases of U.S. government securities: down in 2007 ($270 billion) but back up in 2008 and 2009. The leading purchasers were China and Japan. They want to keep the dollar strong. In 2008 and 2009, it appears the bloom came off the rose for foreigners in terms of U.S. equities: They sold $166 billion in the 2008 panic and did not return in 2009. 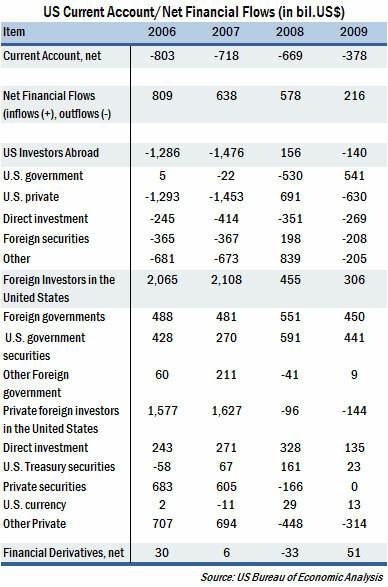 American investors on the other hand, increased their purchases of foreign equities in 2009. In Table 3, I have consolidated data from Table 2 on private investors. It provides the net of U.S. private investments abroad and private foreign investments in the US. 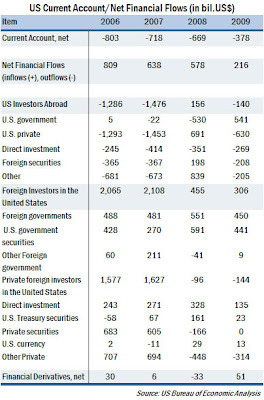 The numbers are scary as Americans keep investing overseas as I have been recommending and foreigners are reluctant to invest in the U.S.
And take a look at the last row in Table 2. If the speculators smell a weaker dollar, they will make it happen. I have been arguing that investors should get out of dollar-denominated assets since May 2009. If these numbers don't convince you to do so, nothing will. My specific suggestions have not changed since my last article on the subject. I like Mauldin, he makes me think. But in his latest chapter draft, there are a few missing pieces. This article by Elliott Morss has been republished from The Street, an investment news and analysis site.